Per Amazon, this watch was designed with WWII styling in mind. It comes in an open top box, zip-tied in place on a plastic display piece with warranty/instructions paperwork inside the plastic. 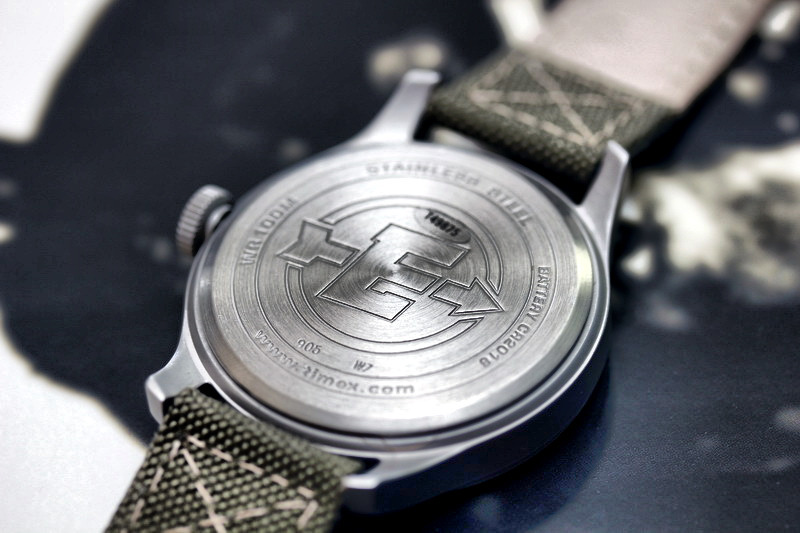 This watch is 42mm, excluding crown and the case is stainless steel. The case is very lightweight, as is the whole watch with strap, it shows off a brushed look, which you would get from titanium. Three settings can be accessed through the crown, the quick-change date function (or date complication) which some cheap watches do not have at all (you would have to turn the crown until the desired date number is visible) and it has a hack-style (stops ticking) time change function. The crown, when pushed all the way to the left (towards the case) activates the Indiglo feature (seen below). The movement is a quartz automatic analog with date function which keeps excellent time (duh its a computer). The strap is nylon on the exterior and leather on the interior (more in the review). On the Timex website it is listed for $64.95, but I was able to purchase it at a local Target for $39.99 plus state tax. A lot of watch for the money. 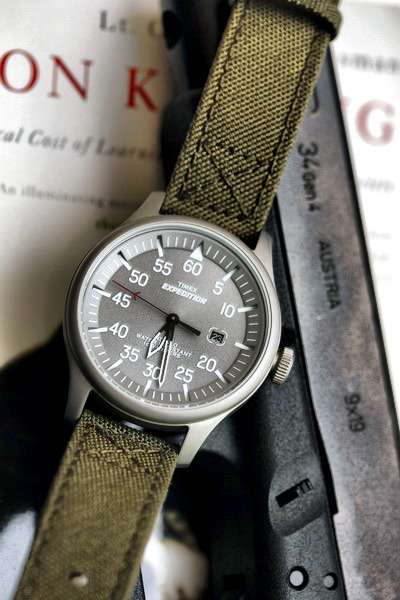 This watch was purchased with the primary goal of wearing a cheap, but durable analog watch, with a night-view ability for duty work. I needed something light, durable, cheap, and easy to read. This watch fits the bill, especially at this price point. When I first brought this watch home and cut the single zip-tie off the strap and placing it on my wrist, I really liked the feel and look of the watch. It was not as heavy as I thought it was going to be. The straps exterior looked very durable and reminded me of a "pilot" design of WWII, with the box-stitch pattern it displayed. 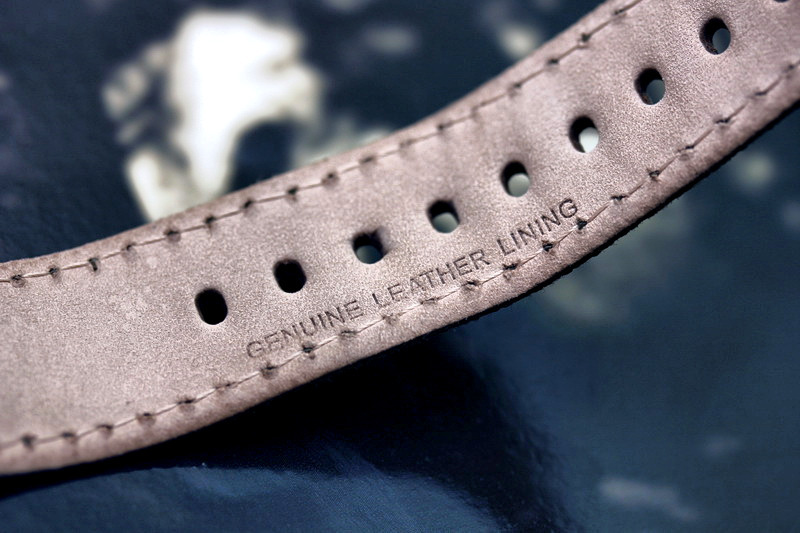 The interior of the strap (skin-side) has "genuine leather lining" on it by the strap holes. It is fine leather, but nothing that can be compared to straps for the more expensive brands, which straps may cost upwards of 10 times the cost of this entire watch. 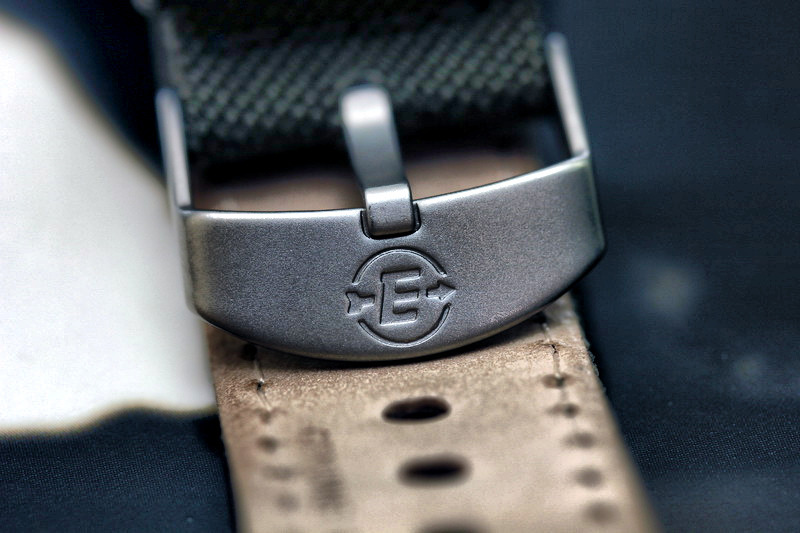 The strap is held on your wrist by a single metal buckle with the expedition logo on it. Nice and simple, no complaints there. The dial seems a little too busy in my opinion, but I liked the way the second hand was offset in red on the edge and it has Arabic styled numerals, in seconds instead of the traditional hour markers. I have been wearing it for the last week straight, every single day to work. It does not look like its sustained any damage even though I smacked it into a few things by accident and not trying to baby it by any stretch. While I did not expect this watch to have a sapphire crystal the mineral crystal has held up well so far not displaying any scratches, but only after a weeks worth of wear its too early to really tell. The most obvious and blatant "issue" for me is how I wear the watch. I like to wear my watch a little loose, I do not like a watch to be very tight on my wrist, so on this strap I have to put it into the 3rd from top notch and its just slightly too loose that it turns over on my wrist sometimes, which results in me having to fix it once in a while. If I use the second from top notch it is too tight. Not a very big complaint, if a complaint at all, just means I need to gain some wrist girth. Aside from that I have worn the watch and have been happy with its appearance and function. The watch has not changed in the week I have worn it, aside from some minor wear on the strap. I have seen some rubber straps for sale online which would fit this watch very well and I would still be able to use the buckle, which may be the way to go if the nylon strap every rips or breaks, but that would be a long time away. 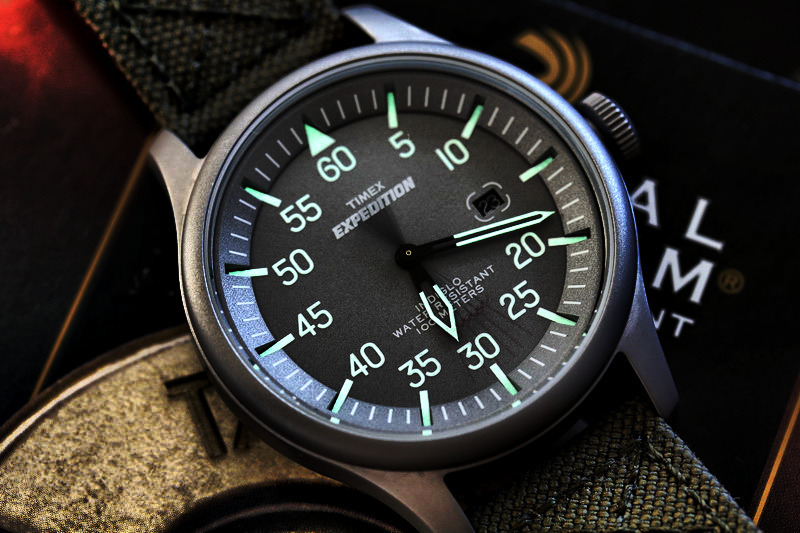 The dial really stands out on this watch to me and the Indiglo functions works very well. I like the way the skeletonized hands help to tell time when Indiglo is activated and how the marks, seconds text and hand glow (though poorly compared to other "lumed" watches). 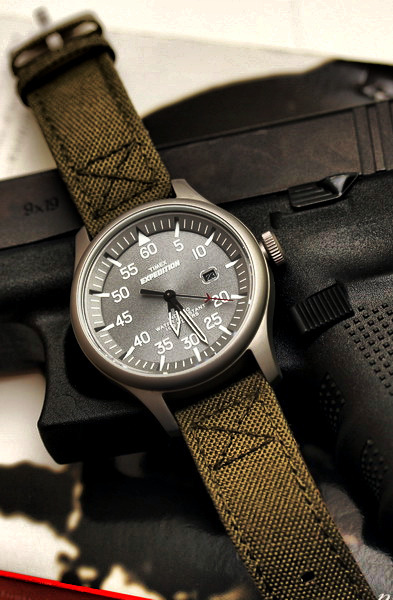 Only time will tell how the watch will hold up to the daily rigors of duty work. This is a forty dollar watch (and some change). For that you get two types of night-lighting ability. You get alleged water-proof ability (I have not tested nor will I), but definitely rain proof (was out in the rain with it). You get a classic analog look and vintage feel. The watch is not a big watch and if you are a big guy you may want to go for something in the 44mm+ area, but even though this watch is the same size as a Rolex Submariner it wears bigger, but not as big as a Panerai, due to the large dial surface. 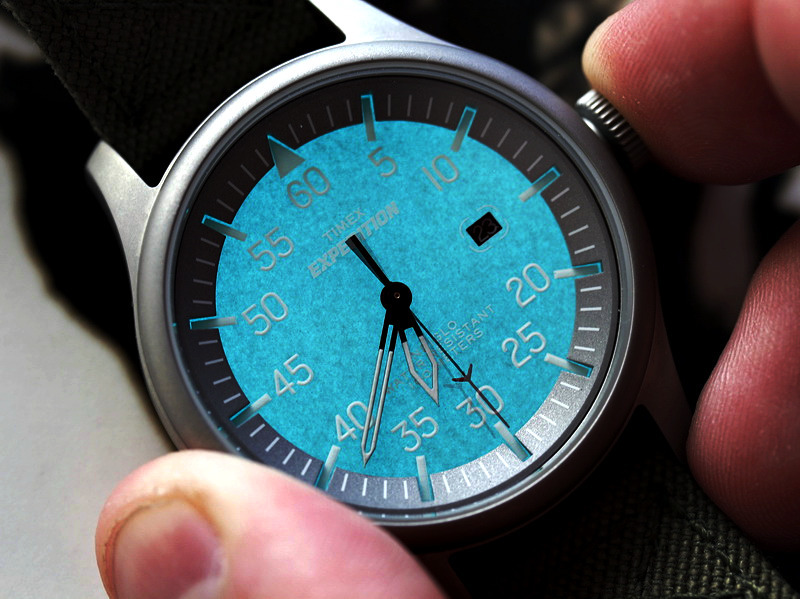 The dial has a 3D design to it which makes it "pop" in the right sunlight. It has a quartz analog movement with date function and keeps excellent time. 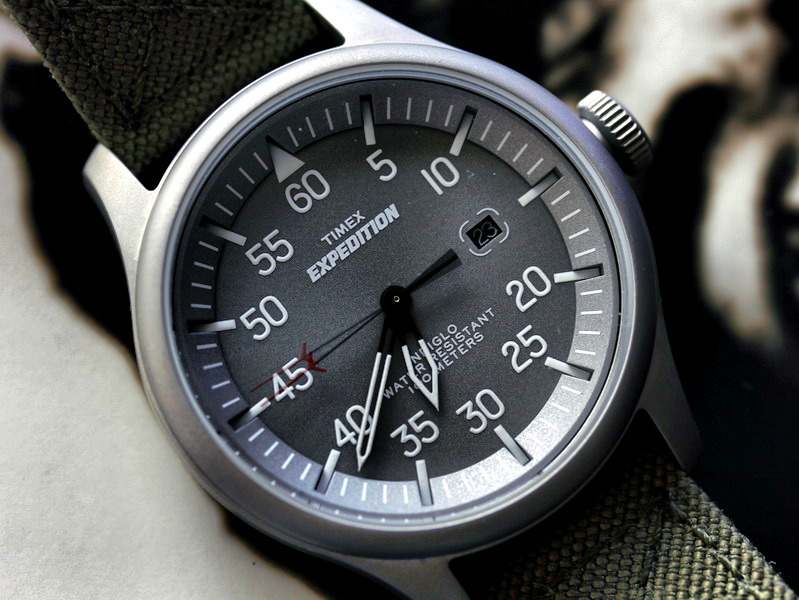 If you take off all the dial text and just leave the numerals you would have an awesome sterile pilot-style watch. It also has "military" in its name, so what is not to like? 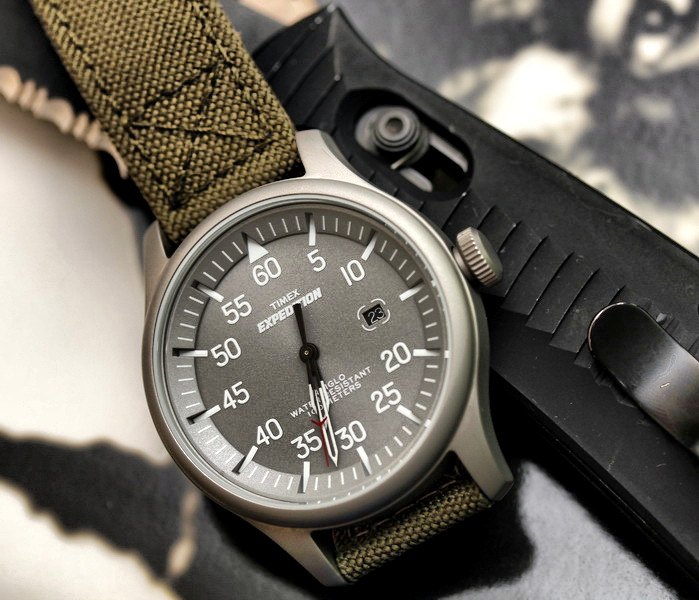 For the price I would definitely go out and get one, especially if you are looking for a daily-worn tool watch that is cheap enough to replace if it ever breaks. The only issues to look out for is the mineral crystal and excessive wear and tear on the strap, both issues will probably not be relevant until a few years of ownership. Some time around 6/2015 this Timex died on me, cannot really put my finger on when, but it was a duty related occurrence. I have since purchased a Seiko, as a replacement.